"A stitch in time saves nine" - relearning old lessons. You may have come across the term 'watchful waiting' in your research on hernias or been told about it by your doctor. So what does this term actually mean and why is it used when talking about a strategy for dealing with a hernia? 'Watchful-Waiting' is the process of doing nothing but monitoring your inguinal hernia and trying to mitigate the condition. Diet, weight-loss, smoking and healthly lifestyle changes are all recommended elements of this strategy. We would suggest that our compression underwear is also an important factor in self-managing your condition. We have had conversations with our customers who have followed this regime wearing our briefs and a small number have reduced or eliminated their Inguinal hernia. However, these are a very small minority and followed a strict regime of Pilates, Yoga, dietary changes etc. The common trait is that they were proactive, single-minded and committed customers and unlikely to sit back and wait for thier condition to worsen. At first glance watchful waiting seems attractive. For the health provider the key aspect is that as a strategy it appears cheap - very cheap. 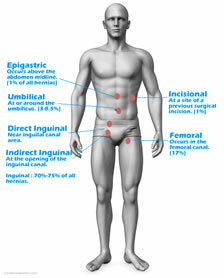 But Inguinal hernias tend to worsen rather than stay benign. In a 2014 study patients that switched from elective surgery to watchful waiting were 59% more likely to require emergency surgery 1 with all its associated costs. Watchful waiting is considered an alternative to surgery, particularly for mild asymptomatic hernias where the pain is absent. This is actually mainstream policy (at least in the UK and many other western countries). This doctrine was endorsed in a flawed 2009 McKinsey report to the Department of Health that failed to model patient outcomes over time and focused on the initial savings. Watchful waiting is contrary to Royal College of Surgeons and NICE advice where surgery is recommended for nearly all occurrences of Inguinal Hernia. In addition, the hidden costs of an inactive work-force of peak-earning middle-aged men with debilitating hernias are also ignored. When is it not a suitable course of action? If your hernia is painful or impacting your work or quality of life then a course of 'waiting' for improvement will have little benefit and will probably make your condition worse over time. In a study of 700 patients, 90% reported increased pain with time over a period of 10 years on watchful waiting 4. You may also be giving up surgical options in the future if you are unlucky to get another condition that affects your ability to have anaesthesia. A recent article in Annals of Surgery (September 2013 - Volume 258 - Issue 3 - p 508–515) describes a long-term trial of men with Inguinal Hernias. Of the 254 men who consented to a period of watchful waiting, just 32% had requested surgery in the follow-up period of 7 years (younger men fared better than older men at managing their hernias). This is despite the small risks of complications from strangulated hernias and peritonitis which often encourage patients to elect for surgery. "Men who present to their physicians because of an inguinal hernia even when minimally symptomatic should be counselled that although watchful-waiting (WW) is a reasonable and safe strategy, symptoms will likely progress and an operation will be needed eventually"
4 - Chung, L., J. Norrie, and P.J. O'Dwyer, Long-term follow-up of patients with a painless inguinal hernia from a randomized clinical trial. Br J Surg, 2011. 98 (4): p. 596-9.